While the cherry diet seems like a healthy option for disease prevention and shedding pounds, you may be wondering if it is really worth your while -- or just another fad. Knowing more about the cherry diet will help you determine if it's a good fit for you. What Is the Cherry Diet? The cherry diet is pretty basic. Simply eat cherries (sweet or tart) or drink fresh cherry juice every day. The diet isn't a weight loss diet, although you can lose weight on it if you reduce your overall calorie intake. The rationale behind the cherry diet is to reap the many health benefits of cherries. There isn't a set amount of cherries or cherry juice you need to consume, but the Dietary Guidelines for Americans 2010 suggest eating two cups of fruit or 100 percent fruit juice when eating 2,000 to 2,600 calories daily, and one cup of fruit or juice when following a 1,200-calorie weight loss plan. There is some evidence adding cherries to the diet may confer health benefits. Depending on the health benefits you seek, you may eat either tart or sweet cherries, which are deep red in color and high in antioxidants. Cherries are rich in vitamin C, other antioxidants, and fiber. The dark red color comes from antioxidants called anthocyanins, and the American Institute for Cancer Research notes both sweet and tart cherries contain these compounds, although the tart cherries have higher levels. These delicious fruits may also help lower your risk for heart disease, cancer, diabetes, and Alzheimer's disease, according to a 2011 review published in Critical Reviews in Food Science and Nutrition. Another study in 2003 noted tart cherry juice reduced human colon cell cancer proliferation. A 2007 animal study found tart cherry consumption may help in the prevention of diabetes and heart disease. Another study also showed a reduced risk of cardiovascular disease and diabetes from consumption of tart cherry juice. Results from another study suggest tart cherries may be beneficial for boosting brain function, particularly as it relates to Alzheimer's disease. Compared with many other fruits, cherries have a relatively low glycemic index, which is beneficial when you want to control blood sugar levels. Cherries - either sweet or tart - may help with symptoms of gout and osteoarthritis. Some research suggests eating 10 cherries or more daily may help manage symptoms of gout and reduce the risk of gout flares by up to 50 percent. Another study showed consuming 16 ounces daily of tart cherry juice helped reduce symptoms of osteoarthritis. Cherries are also a source of melatonin, and one 2012 study found drinking tart cherry juice helps improve sleep quality and duration. 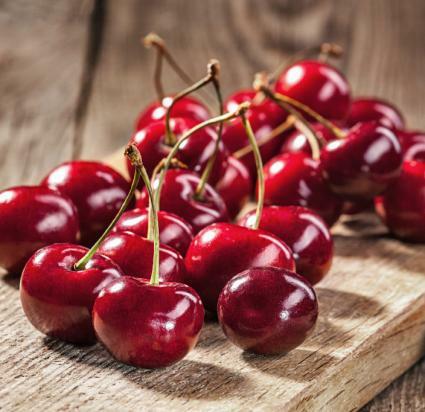 There really aren't any drawbacks of adding cherries or cherry juice to your meal plan, unless you consume these foods in excess or have a cherry allergy. Eating too many cherries or cherry juice as a replacement for other foods can put you at risk for certain nutrient deficiences, such as protein, healthy fat, vitamins, and minerals. If you're sensitive to cherries, you may experience an allergic reaction, especially when eating them in large quantities. Following the cherry diet may provide you with health and nutritional benefits and lower disease risks, but only when used in combination with a well-balanced healthy eating plan and in recommended portions of one to three cups (of fruit) daily, depending on your caloric needs. The only way adding cherries or cherry juice to your diet will work for weight loss is if you lower your overall calorie intake. If shedding pounds is your goal, eat 500 to 750 fewer calories daily to lose 1 to 1.5 pounds per week safely.